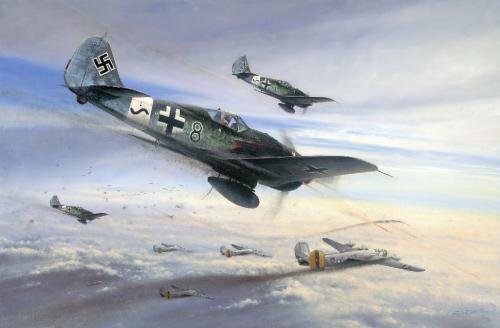 As the Allied Air Forces began their massed attack on Germany’s oil refineries, the Luftwaffe was about to hit back with a new battle tactic– the Sturmgruppe! Richard Taylor’s exciting new limited edition captures the scene: Closing at high speed with all cannons blazing, Unteroffizier Willi Maximowitz is seen flying his distinctive “Black 8” with IV Sturm/JG3, as he dives in to attack a formation of USAAF B-24s from the 93rd Bomb Group. The American gunners have a frightening task on their hands to fend off the attack until help arrives. THREE highly experienced Luftwaffe pilots who flew the Fw190 A-8 in Defence of the Reich have added great authenticity to Richard Taylor’s new Limited Edition by signing each print. THE REMARQUES Richards pencil work is easily amongst the best anywhere in this industry and his original pencil remarques are first class. He has already completed a DOUBLE REMARQUE on this new print for us and it looks nothing short of superb with an Fw190 in pencil on each end of the tinted border. However, with only ten copies available, we urge you to call as soon as possible to check availability.